If mz3Tool isn’t installed yet, please follow the following steps. mz3Tool is available as test version mz3Demo. This version offers almost full functionality and is available as free download. mz3Tool as full version is available as a download via the link provided with the confirmation email after a purchase of the license. *Hint: Since the mz3Tool Installer is downloaded over the internet, Windows shows a warning and blocks an immediate start. On the left, you find Firefox’ warning if you install directly after downloading within Firefox. 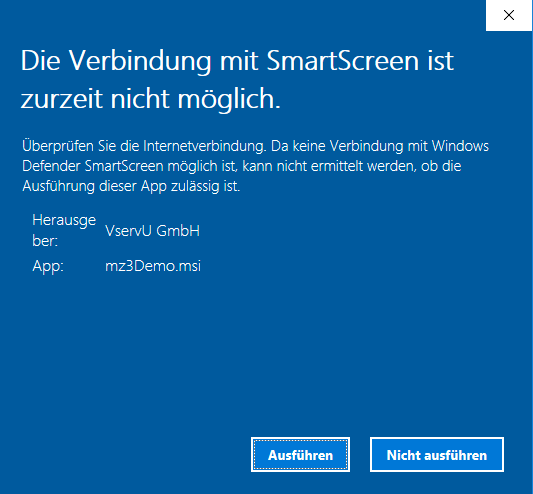 On the right Microsoft’s Defender SmartScreen. Remark: I’m personally using Eset antivirus and firewall, and not Microsoft Defender. mz3Demo is checked for virus and signed, so please go ahead, accept and install/execute the Installer. After passing this first hurdle the installer runs and you should confirm any questions “as usual” to accept the standard settings. After the installer finished it’Äs job, you’ll find a mz3Demo or mz3Tool icon on your desktop. *You first have to confirm in the security settings that the execution of the program you downloaded over the internet is accepted. The App can be found in the “Applications” folder and started like any other App.